This post was sponsored by AVEENO® BABY® Sunscreen however all thoughts and opinions are completely my own. Who’s ready to kick off summer this Victoria Day long weekend?! We have big plans that will include lots of lounging in the sun with the kids and I couldn’t be more excited. It feels like summer took wayyy too long to get here this year so I’m really looking forward to spending some family time outdoors this weekend. 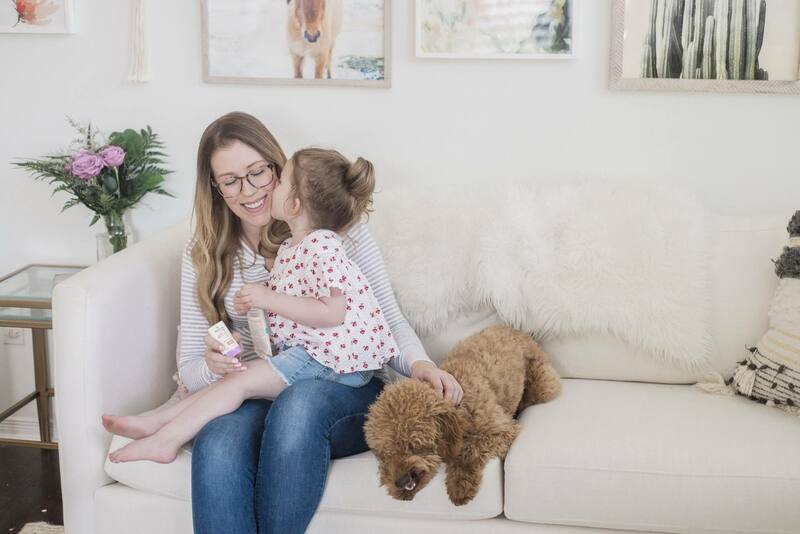 While we’re on the topic of sunny summer days, I want to share our favourite sunscreen products with you, so you can pick some up before the long weekend begins. Trust me, you’re going to love these for the kids! Every day, before I get the kids dressed in the morning, I lather them up with sunscreen, so I don’t forget. 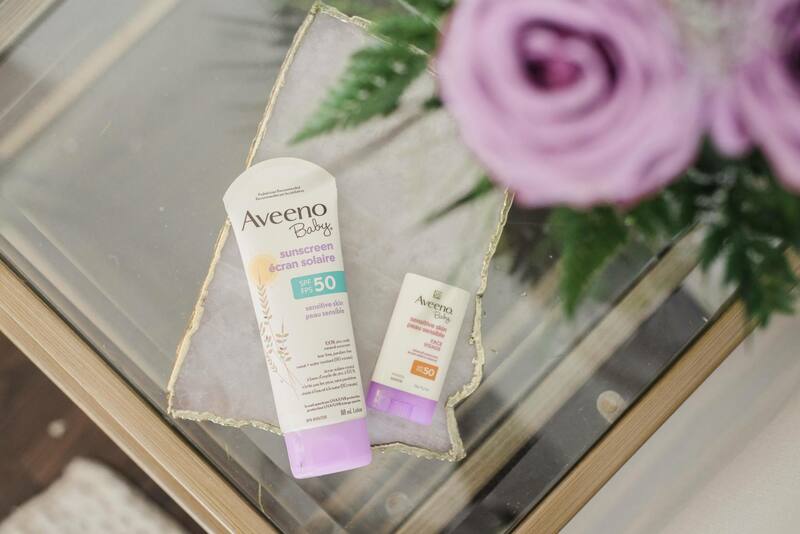 We just started using the AVEENO® BABY® Sensitive Skin Face Sun Stick SPF 50 and let me tell you, it’s so much easier to apply sunscreen on the kids’ faces now. No more mess and stinging eyes…every mom’s dream! I’m glad there’s a product out there that makes sunscreen application easier on the kids’ faces because they used to constantly be in tears when product would get in their eyes. Not anymore! It’s also the perfect size to throw in your purse so you can reapply throughout the day without carting a big tube around. Super handy if you’re headed out this long weekend! We’ve also been using AVEENO® BABY Mineral Sunscreen SPF 50, which we apply everywhere but the face. It’s the #1 pediatrician recommended baby skin care brand, so I know it’ll be safe to use on the kids. This is always something I look for when purchasing sunscreen. 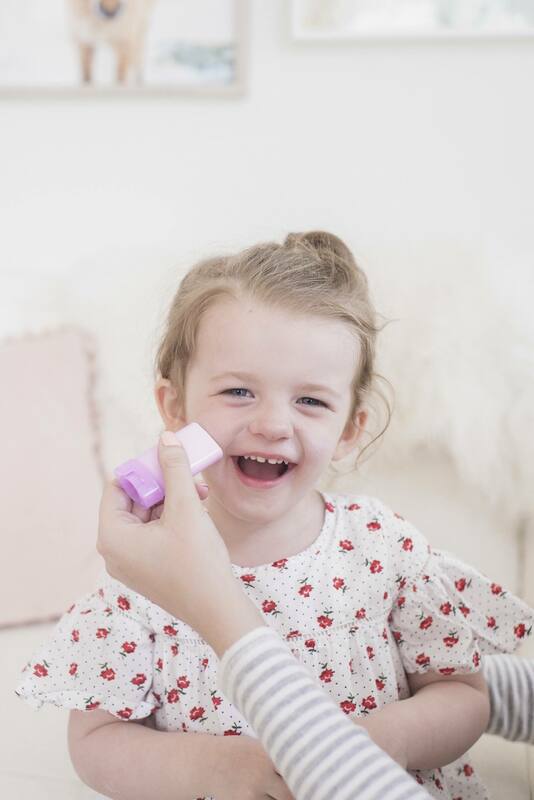 Our kids are all fair and have really sensitive skin, so I want to make sure I’m buying products that are safe and won’t irritate them. This AVEENO® sunscreen uses 100% naturally-sourced zinc oxide, a natural UVA / UVB filter, for effective sun protection. 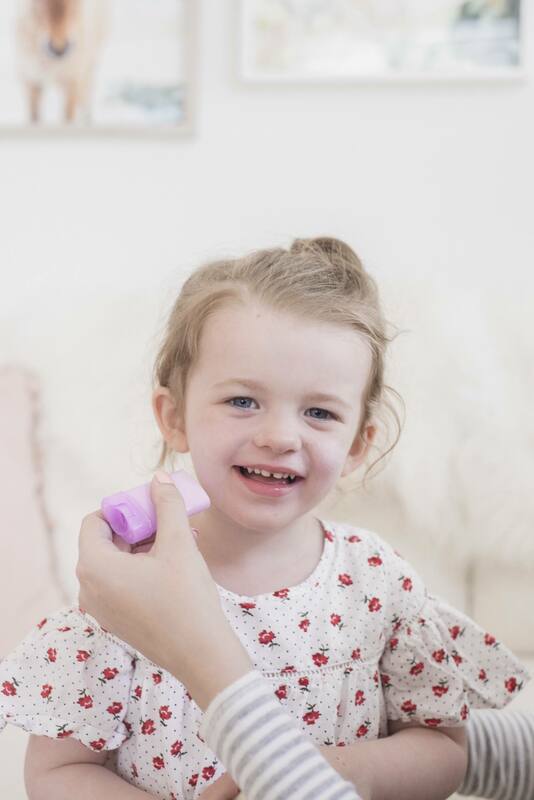 It also locks in moisture and nourishes and soothes my kids’ delicate skin with ACTIVE NATURALS® Oat. Have you tried the AVEENO® BABY® Sensitive Skin Face Sun Stick SPF 50 yet? If you haven’t yet, I’m telling you, it’ll make sunscreen application with the kids SO much easier. I hope everyone has a safe and fun long weekend! Want a chance to win?! 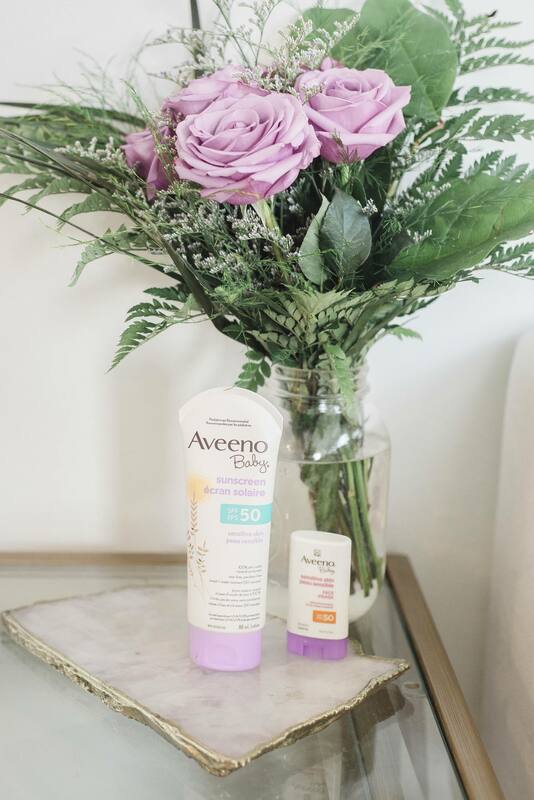 I’m giving away THREE sets of AVEENO® BABY Mineral Sunscreen SPF 50 and AVEENO® BABY® Sensitive Skin Face Sun Stick SPF 50, each set is valued at $35 CAD. Simply comment on this post and let me know your plans for the summer. Good luck! Giveaway ends May 25 2018. I am operating this giveaway on my own! Winners will be asked to fill out a release form to claim their prize! This summer we plan on taking our son to toronto for 2 weeks. We are going to go to the zoo and visit family!! Thanks! We are going to be going to my in-laws for a family reunion this summer! Can’t wait! Were going up to Nova Scotia in July! We are going to VA and NJ to visit family and the beach. I am going to bike more, thank you for the great offer!! Lots of picnics, road trips, and exercise! Probably gardening too. I will watch some new movies and finish off some on my to watch list. Planning lots of hikes and swimming! Hoping to do some camping and fishing. Working, walking the nature trails around town, and a week in a house rental on Manitoulin Island with my brother and his family. I plan on visiting family and have BBQ’s! I plan on having fish & chips at the lake. My plans for this summer are lots of camping and swimming! Having fun and making memories is #1! We are looking forward to the beach. We will be taking the grand kids to the beach, near our home in Nova Scotia, many times throughout the summer. this would be perfect for us. We are going on a Baltic cruise this summer. Summer plans are to spent as much time with my babe as possible before #2 arrives in September! What’s good for baby’s skin is probably good for all of us! This summer I plan to work in the garden and go for bike rides with my husband. We are planning lots of beach days, and picnics at the park. Hoping to spend some time at the cottage! I plan on spending time outside and planning for my future. We will be spending our summer up at our property, hiking and fishing with the kids. Every summer we go on family bike rides, at least when the weather allows it. We also have a few weekend road trips planned. We’re planning to spend a lot of time at my parent’s place by the lake. We live in Florida so we take frequent trips to the beach, but I am most excited that we are going to clearwater aquarium to see the dolphins from the movie A Dolphin Tale! My daughter loves those movies, so we are so excited to go! I plan to have my fifth child this summer! I plan on having baby #5 this summer! We are working on growing a garden. We hope to go camping and fishing several times over the summer. I’ll be going to the beach a lot. Going to six flags and hurricane harbor! My plans for summer is a lot swimming and cookouts, plus a trip to Disneyland. I’m planning to start a garden this summer 🙂 Or maybe I should start in the Spring?? I’m not sure – never really gardened before :P! My plans include many trips to the waterpark, Cedar Point(It’s local to us), the beaches, hiking trails, and lots of parks and picnics! My children play soccer in the Summer as well. We love staying active and spending a lot of time together during the Summer season. I will be visiting Penticton, B.C. this summer and enjoying the local lakes for picnics and swimming. My plans for the summer are, I’m going on a Vacation with my family to Daytona beach in Florida…we’re planning on renting a hotel room for two weeks and going to the beach. I am having my first baby this summer, due Aug 1st! My son loves water and sand sober plan on having a lot of beach days ahead of us.I use Aveeno for my psororis and wouldn’t trust another product to protect my son from the sun.thanks for the chance to win a great product.